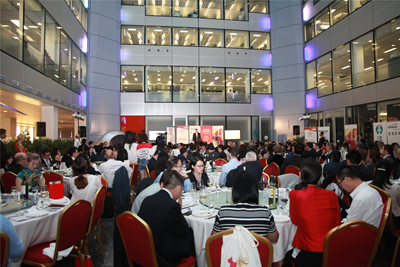 It gives me great pleasure to join you again for this year's Young Icebreakers' Dinner. For Young Icebreakers, this is the ninth anniversary dinner. For me, this is the eighth annual dinner that I have attended consecutively. The past nine years have witnessed the growth of Young Icebreakers and your active contribution to advancing China-UK relations, particularly the youth exchanges between our two countries. Chairman Perry asked me to talk about China-UK relations and the just concluded Belt and Road Forum for International Cooperation. Great minds think alike! That's exactly what I have in mind. 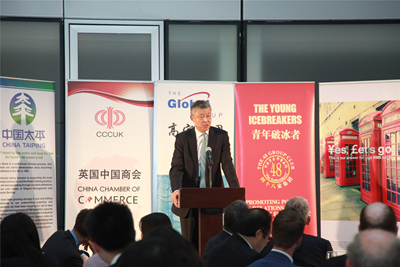 Speaking at the 2015 Young Icebreakers' dinner, I used six W's to explain the Belt and Road Initiative. Two years on, I am sure you are interested to know more about this Initiative. What is the prospect for China-UK cooperation? What roles can Young Icebreakers play in the process? Let me share with you my answers to these questions, starting with the progress achieved at the Belt and Road Forum. On 14 and 15 of May, the Belt and Road Forum was successfully held in Beijing. This international gathering brought together 29 heads of state and government, and 1,500 representatives from over 130 countries and 70 international organizations. I want to use acronym of the Belt and Road Forum -- B-R-F to describe the progress: B for blueprint, R for resonance and F for fruit. First, the Belt and Road Forum drew a blueprint for cooperation. It was a forward-looking summit. President Xi delivered a keynote speech at the Forum. He expounded on the Silk Road spirit. That is the spirit of peace, cooperation, openness, inclusiveness, mutual learning and mutual benefit. He reviewed what we have achieved so far over the past four years in building the Belt and Road. He pointed to the way forward and call on all partners to build a road for peace, a road for prosperity, a road of opening up, a road of innovation and a road connecting different civilizations. President Xi's speech was highly acclaimed by the leaders of the Belt and Road partners. A Joint Communique was adopted at the Leaders Roundtable. The Communique sets out the objectives, principles and measures for the Belt and Road cooperation and the vision for the future. It sends out a message that all parties are working together to advance Belt and Road cooperation and to create a community of shared future for mankind. Second, the Belt and Road Forum created resonance among participants. It was a consensus-building summit. President Xi said, "Deficit in peace, development and governance poses a daunting challenge to mankind". It takes a joint response to tackle these challenges. This Forum is a great opportunity to bring everyone together for consensus building and joint actions. The Forum reflects the extensive international recognition, support and enthusiasm for the Belt and Road. The Forum builds an expanding network of friends and cooperation partners. The Forum gathers increasing momentum for cooperation. The leaders and representatives of participating states spoke highly of the progress so far in the international cooperation on the Belt and Road. They believe the Belt and Road will create new growth points, stimulate endogenous development and boost global growth. It will help make economic globalization more inclusive and enable participant to share the benefit. Its core principles of extensive consultation, joint contribution and shared benefit have become widely accepted. Its five key objectives, namely, policy coordination, infrastructure connectivity, unimpeded trade, financial integration and people-to-people bond, have become the common goals of all interested parties. Third, the Belt and Road Forum was a summit of fruitful outcomes for all to share. The extensive and in-depth discussions have been translated into a long list of deliverables. They are divided into five categories, including 76 agreements and 270 specific outcomes. These deliverables, listed in both bilateral and multilateral agreements, include projects in all the five key areas of the Belt and Road Initiative I mentioned a moment ago. They will enable cooperation for common prosperity. They will bring more benefit to people along the routes and around the world. The list of deliverables also contains a number of new measures that China pledges to take. The China Development Bank and the Export-Import Bank of China will set up special lending schemes to support cooperation on infrastructure, capacity and finance. These lending schemes will be worth an equivalent of 250 billion RMB and 130 billion RMB respectively. All these funds will be used in a way that is business-centered and market-based. That will mean stronger support in investment and financing for the building of the Belt and Road. This year marks the 45th anniversary of the ambassadorial ties between China and Britain. It is also a year for consolidating the "Golden Era" of China-UK relations. With regard to the Belt and Road, there is huge potential and bright prospects for China-UK cooperation as we enjoy strategic consensus, solid foundation and strong dynamics. First, China and Britain have a clear strategic consensus on the Belt and Road cooperation. During President Xi Jinping's state visit to the UK in 2015, China and Britain agreed to form a stronger synergy between our two countries' respective development strategies, especially stepping up cooperation on the Belt and Road. During the 8th China-UK Economic and Financial Dialogue in 2016, the UK's role as a key partner of the Belt and Road was clearly defined. Prime Minister May said on many occasions that the Belt and Road Initiative will bring fruitful outcomes and broad prospects for China-UK cooperation. Last month, Chancellor Hammond attended the Belt and Road Forum as Prime Minister May's personal envoy. He said at the Forum that "Britain, lying at the Western end of the Belt and Road, is a natural partner in this endeavor." Also at the Forum, Britain became the first major western nation to approve and sign the Guiding Principles on Financing the Development of the Belt and Road. China is always ready to join hands with Britain to build consensus and advance cooperation on the Belt and Road. Second, China-UK cooperation on the Belt and Road enjoys a solid foundation. On trade, the UK is China's second largest partner in the EU while China is Britain's second largest partner outside the EU. On investment, China's non-financial direct investment in Britain, at 18 billion US dollars, is far greater than in any other European country. On infrastructure, the Hinkley Point C has become a flagship project in the "Golden Era" of China-UK relations. On financial cooperation, London is the largest overseas RMB offshore market after Hong Kong. The UK is the first major western country to apply to join the Asian Infrastructure Investment Bank. Britain is also the second contributor after China to inject capital to the AIIB special fund. Early this year, the first freight train of China Railway Express made a round trip between London and China's Yiwu, extending the routes of the Belt and Road to the western end of Europe. These are only a few examples of the growing and win-win cooperation between China and Britain. In this process, the interests of our two countries have become increasingly intertwined. This in turn lays a solid foundation for our cooperation on the Belt and Road. Third, China-UK cooperation demonstrates strong dynamism for further progress. At the Belt and Road Forum, leaders of the business community, the financial sector and the academia from Britain were very active in sharing their views and suggestions. and close ties with countries along the Belt and Road routes. These are exactly what is needed for building the Belt and Road. Between China and Britain, we are highly complementary in our cooperation and we can achieve success greater than just mutual benefit. In areas such as new energy, urbanization and green finance, our cooperation is booming. Within the Belt and Road framework, we can jointly explore cooperation with a third party and in a third country. Our cooperation will be more than "one plus one". Our cooperation will deliver benefits to people in China, in Britain and beyond. President Xi once said, in today's world, people of all countries live in a shared community with increasingly intertwined interests. He urges the young people to have a global vision, to embrace cooperation and to work with one another to open up a bright future for humanity. I hope you will continue to uphold the "icebreaking spirit". I hope you will expand your horizon. I hope you will be undaunted by challenges. I hope you will contribute your wisdom and strength to building the Belt and Road and the shared community of mankind. I will count on you to be the champions of the Belt and Road. The Belt and Road Initiative has become an international consensus. It is also a new platform and a new highlight of China-UK cooperation. Here in the UK, the significance of this Initiative is sometimes not fully understood. In some cases, misunderstanding or even misinterpretation exist. That's why over the past months, I have published articles on major newspapers and given speeches on different occasions, in order to answer questions and clear up misunderstanding. I want the British public to understand the Belt and Road and join in to support this Initiative. It is my hope that today's speech will help you learn more about and build up confidence in the Belt and Road. In turn, you will do the same to the British public. Second, I will count on the young icebreakers to be active participants in the Belt and Road Initiative. In China, people say "Knowledge and actions should go hand in hand". In building the Belt and Road, the UK and China have every reason to join hands. The UK has experience, knowledge and creativity. China has unique growth model, technology and market capability. This would be the East meeting the West in a perfect match of our respective strengths. 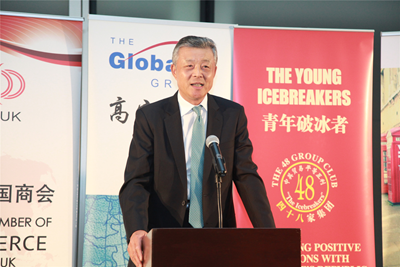 Young icebreakers are leaders and representatives in your respective fields in both China or UK. Your active participation, your wisdom and talents, and your creative spirit, are what's needed in the building of the Belt and Road. I look forward to your contribution to the Belt and Road cooperation between China and Britain. I urge you to join in to deliver more outcomes. Third, I will count on the young icebreakers to be effective communicators for the Belt and Road Initiative. One of the five goals of the Belt and Road is to build closer people-to-people bond. This is indispensable if the Belt and Road Initiative is to make steady progress and bring lasting benefit. As young people, you are energetic, vibrant and creative. Dynamic interaction between the young minds will lead to new and creative ideas. I encourage such interaction. I believe that spreading positive energy and forging closer people-to-people bond is exactly what we need in the Belt and Road. My speech at last year's Young Icebreakers' Dinner was my very first speech delivered after the Brexit Referendum. Today, this speech will be my last speech before the snap election coming up on 8 June. The timing is of course a mere coincide. But it also signifies the underlying changes in British politics. There might be changes around us, but my hope for the Young Icebreakers remain unchanged. There might be uncertainties before us, but my confidence in China-UK relations remain unchanged. I sincerely hope that the young people of China and Britain will value this best time in your life and work hard for your dreams. I count on you to advance China-UK cooperation on the Belt and Road for new outcomes. I count on you to bring China-UK relationship in the "Golden Era" to a new high.